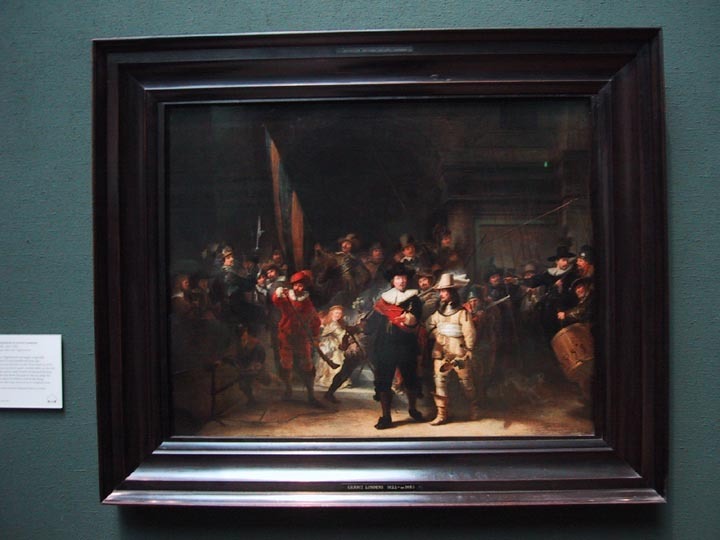 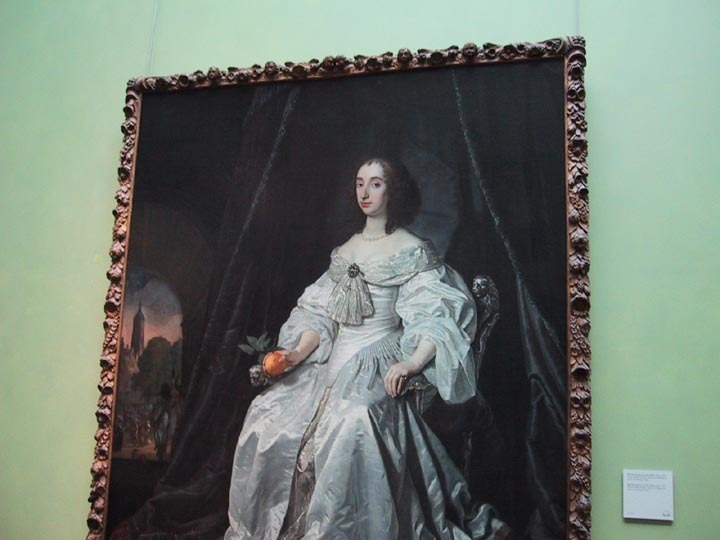 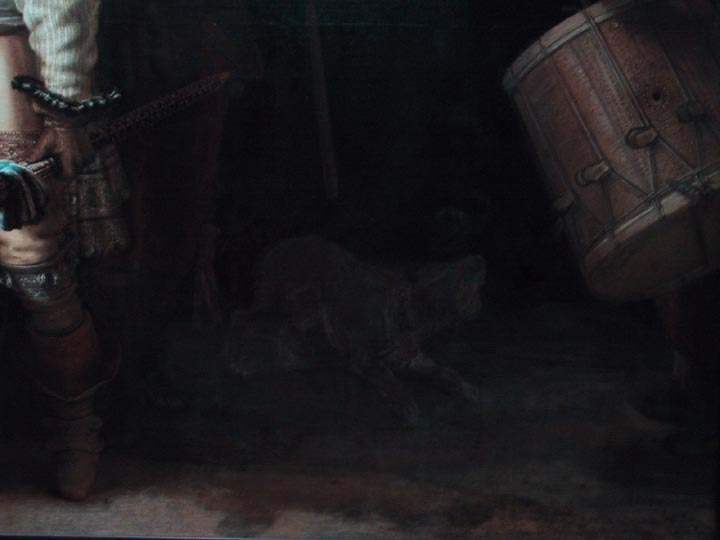 These are additional photos of The Nightwatch, Rembrandt's masterpiece. 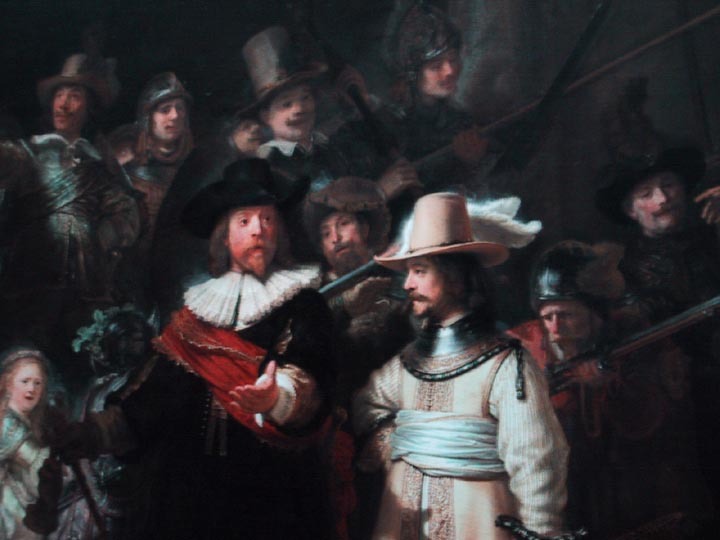 Apparently in the 1600s, Dutch nobles would run their own police force, paying for their own equipment and wandering the city at night. In a lot of ways, this was an old boys network, they went out drinking and partying most nights, showing off their new toys... a lot like boys today! 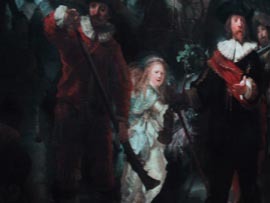 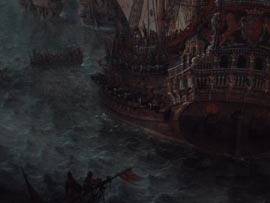 The center of the Nightwatch shows the two senior members of the group in fine detail. Close up of the child in the back of the photo. The shading of this dog in the lower right of the picture is incredible... Beside the original is a copy of the Nightwatch made in minature. 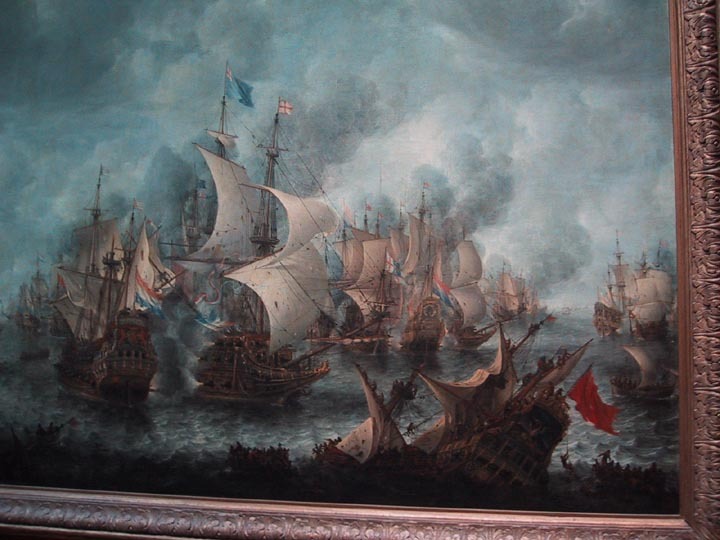 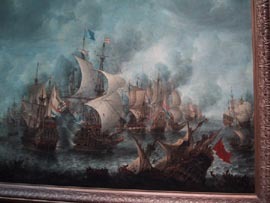 The Battle of Terheide - the English named it the battle of Scheveningen - was the last encounter between the Dutch and English in the First Anglo-Dutch War. The clash was intense, with heavy losses on both sides. 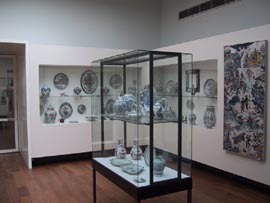 One of the Delft display rooms showing many different kinds of Delft artwork. 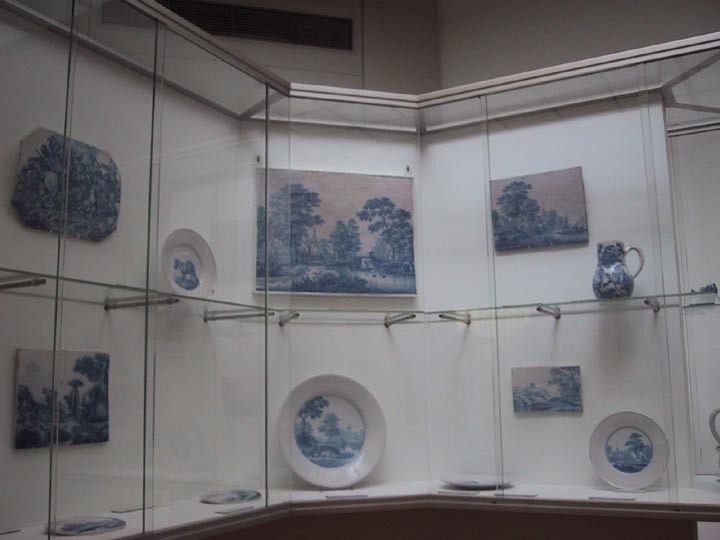 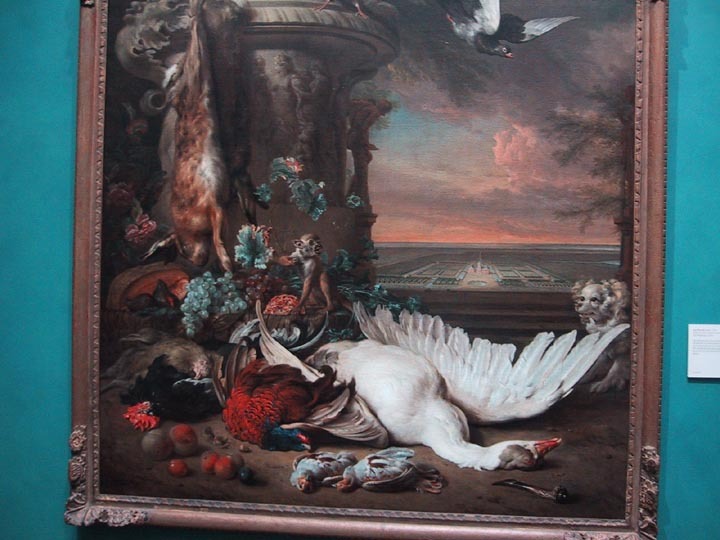 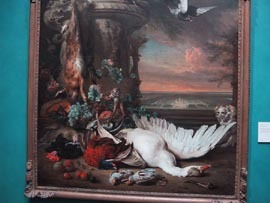 Delft was even used to make scenic pictures, not just dishes and such! 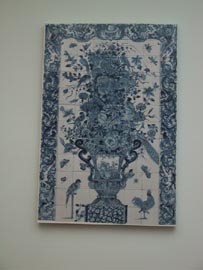 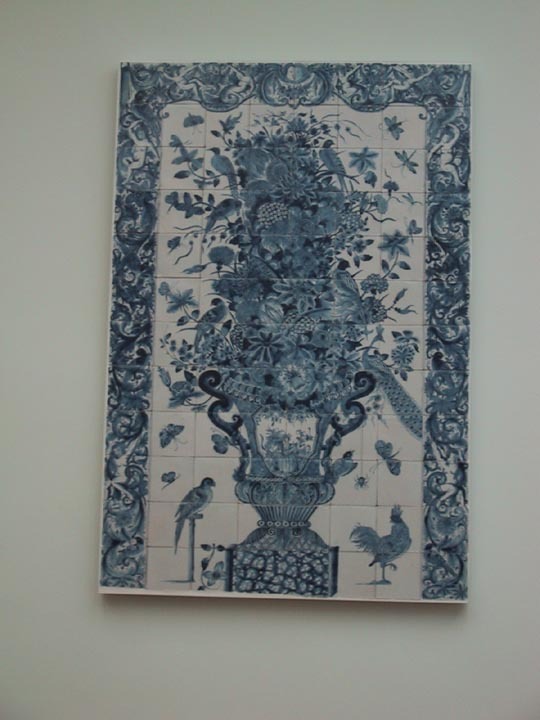 A tiled wallhanging made from Delft. 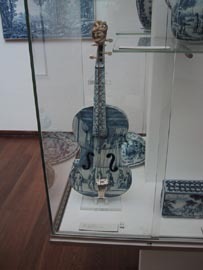 One of the most extraordinary examples of Delft - a violin! 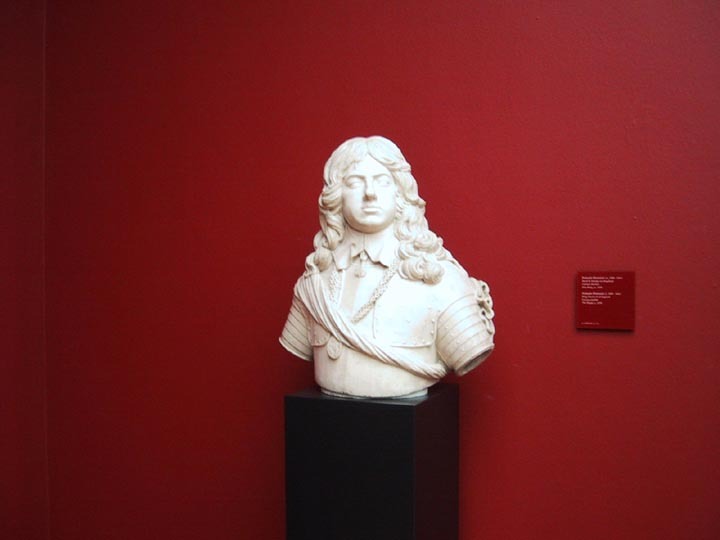 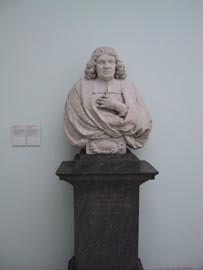 Not sure who it is, but its a beautiful piece of marble... 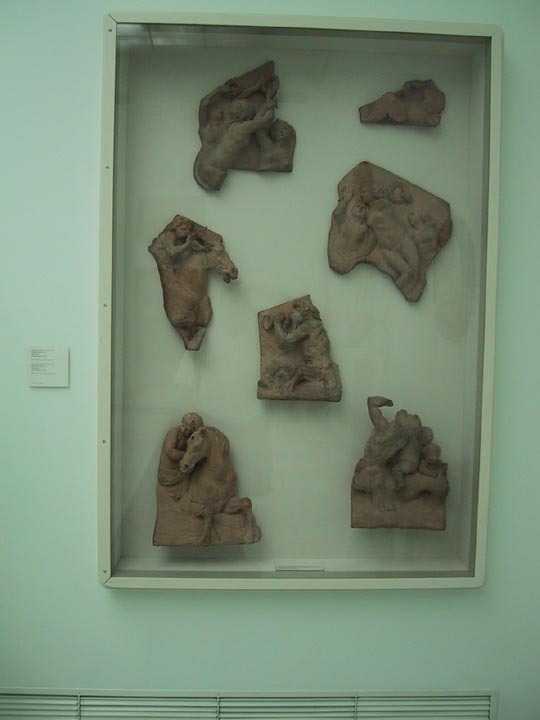 These terracotta samples were prototypes for a sculpture on the side of the Amsterdam city hall. 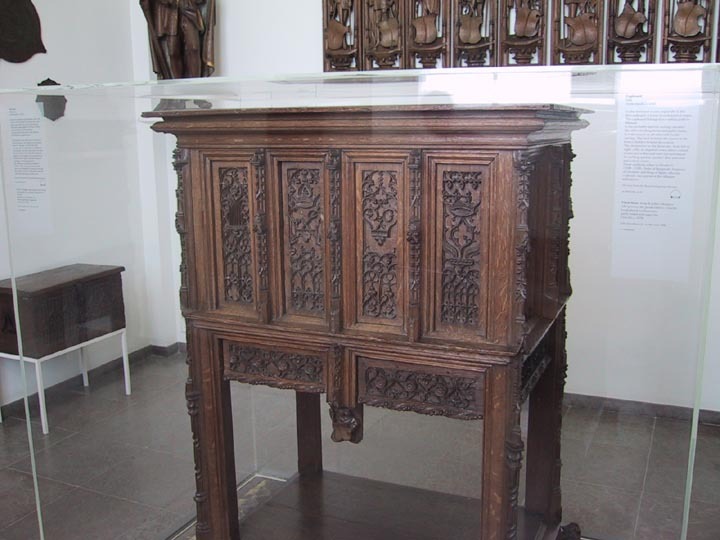 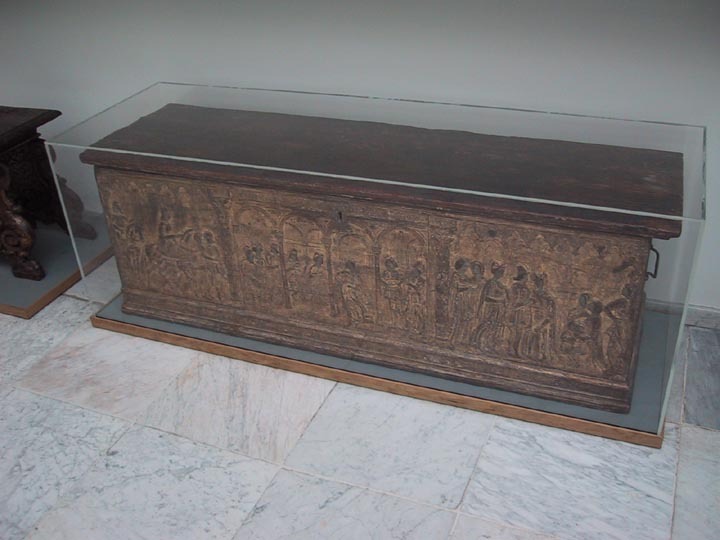 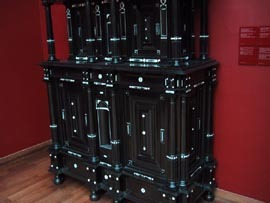 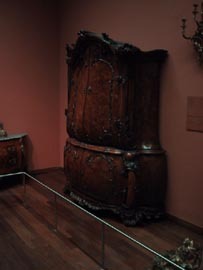 Gothic furniture is rare, especially if, like this cupboard, it is not of ecclesiastical origin. 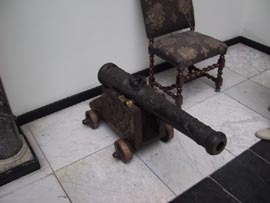 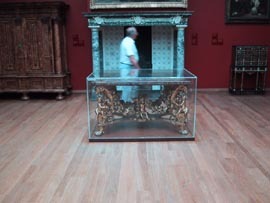 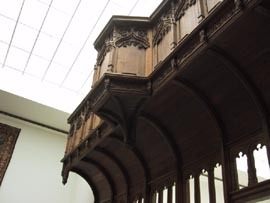 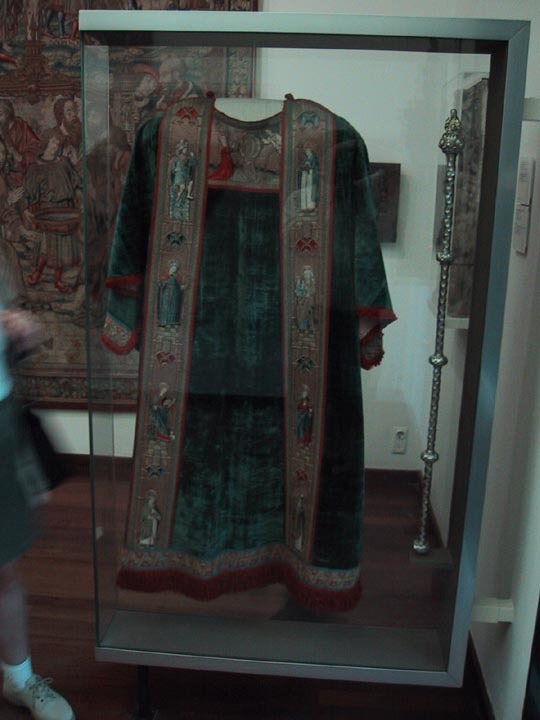 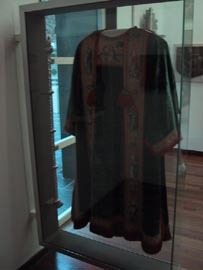 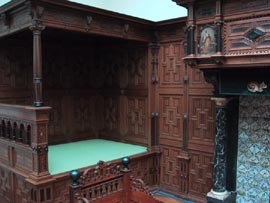 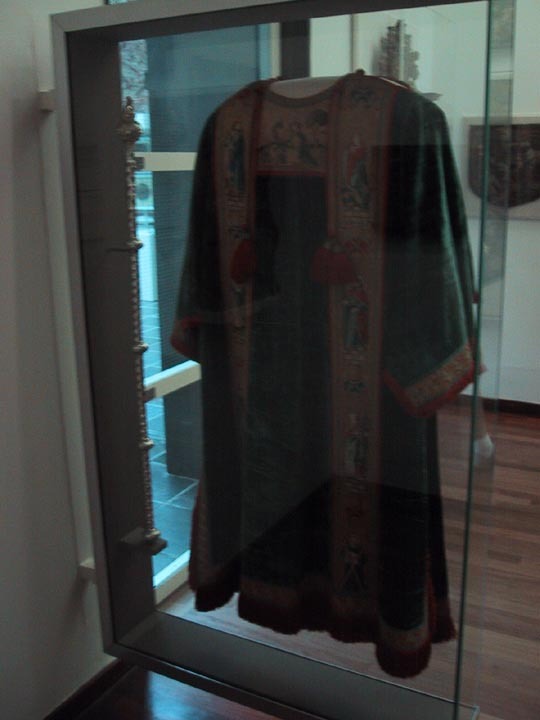 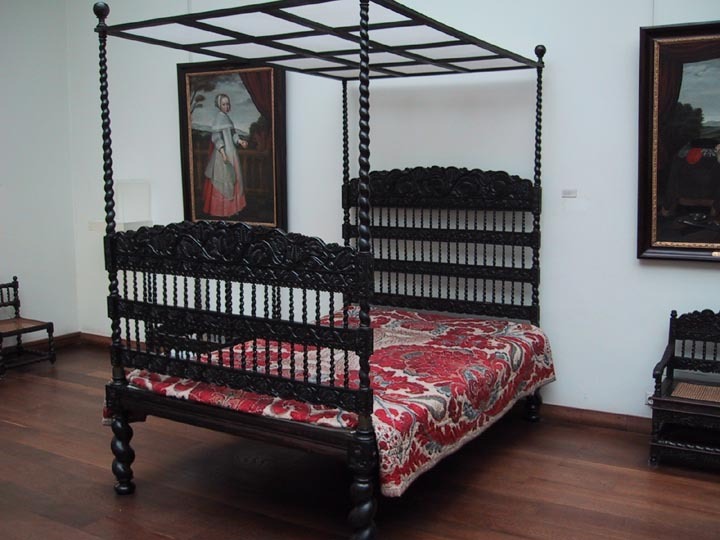 The cupboard belonged to a militia guild in Alkmaar. 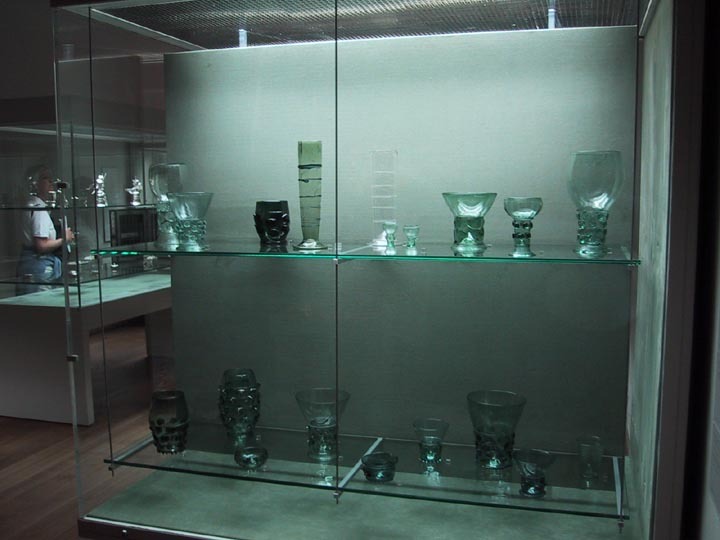 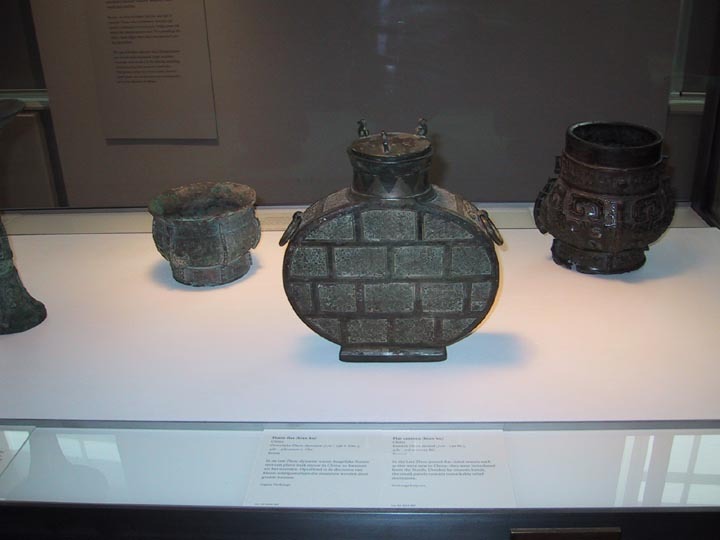 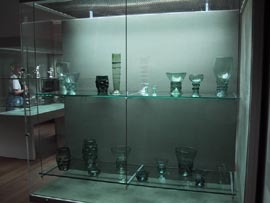 It was probably used for storing valuables like silver drinking horns and guild chains. 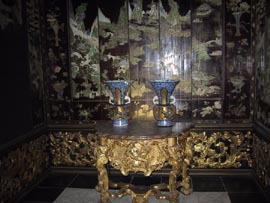 It is decorated on all sides with Gothic carving. 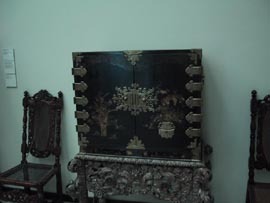 The lock between the doors on the front is hidden behind decoration. 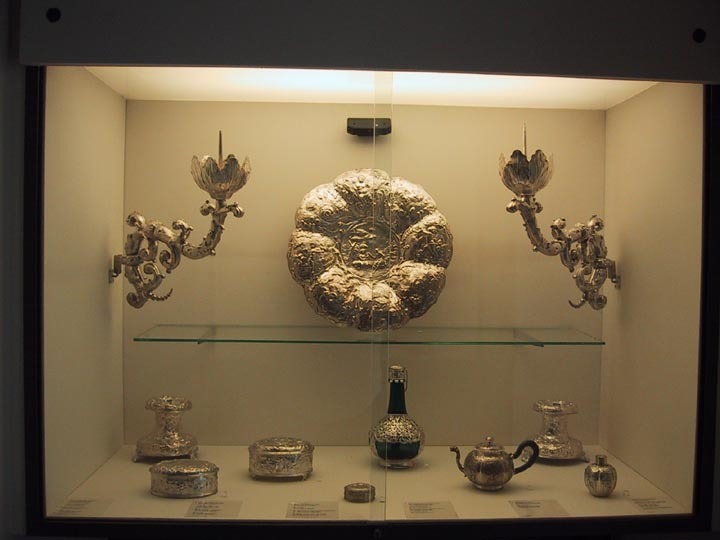 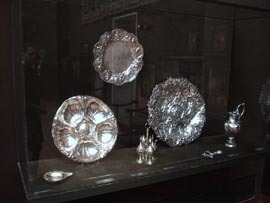 Silver plates and other service items. 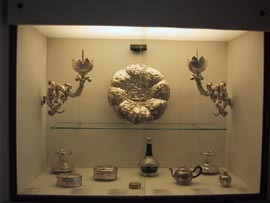 More silver goodies. 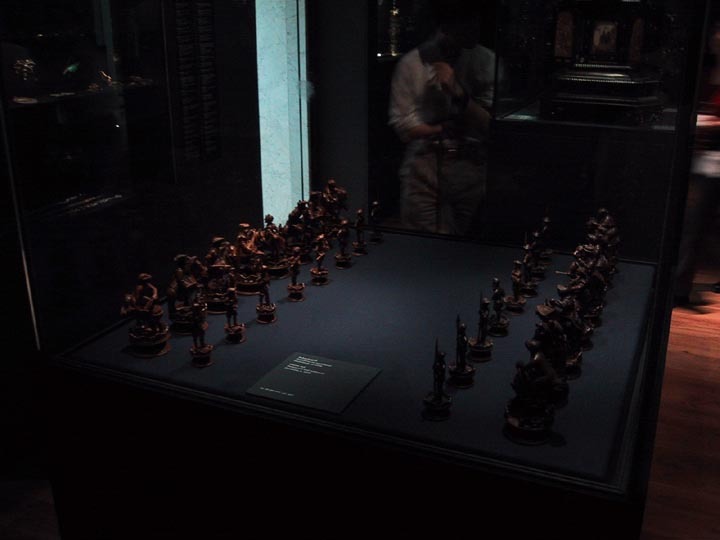 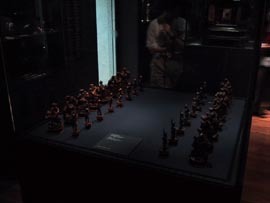 Look, a chess set in a museum! And backgammon! 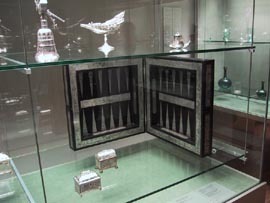 A pair of vases with bird cages around the center. 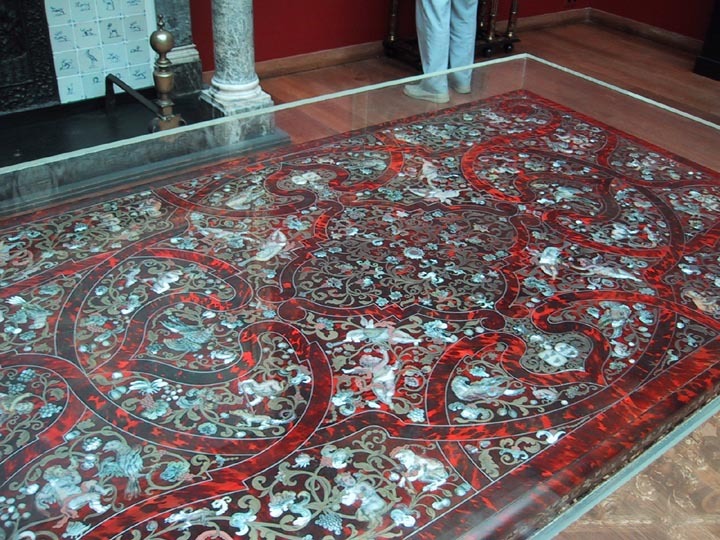 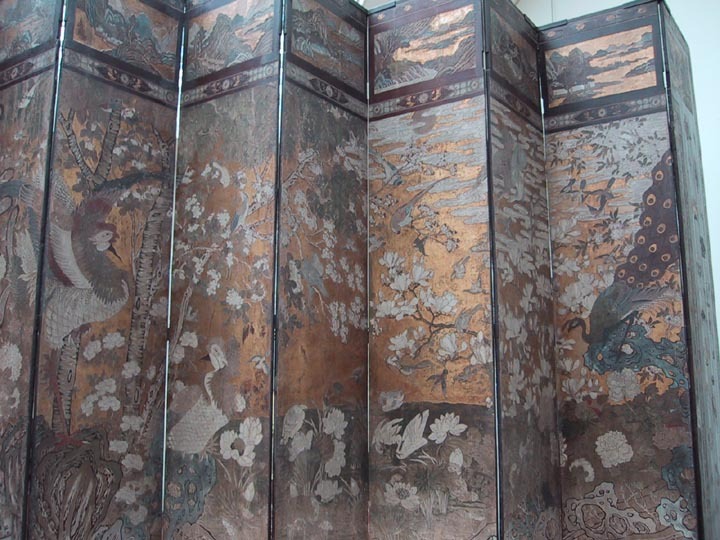 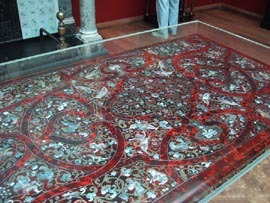 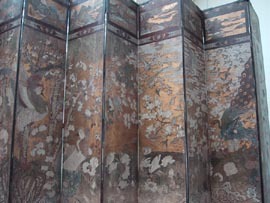 Chinese lacquer board, depicting a scene in China in the 1500s, including drawings of Europeans visiting. 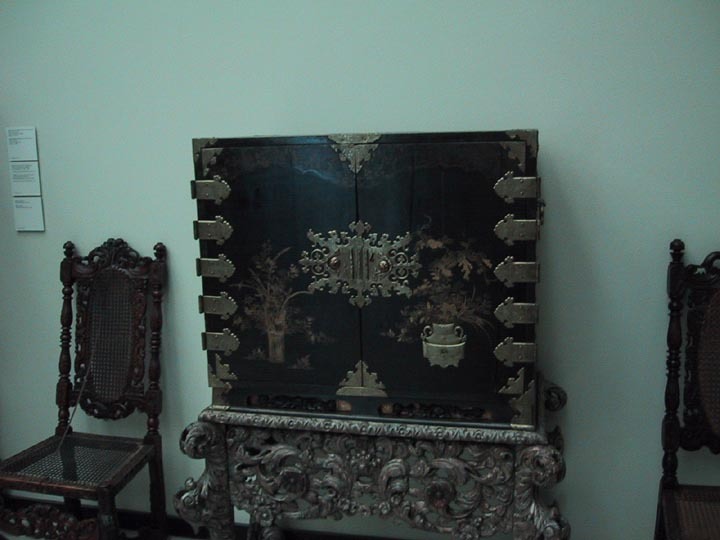 A wooden chest with beautiful inlay work. 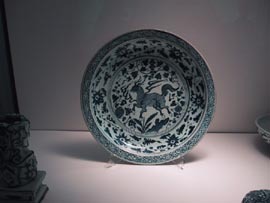 This is what Delft china is based from - original Chinese porcelain. 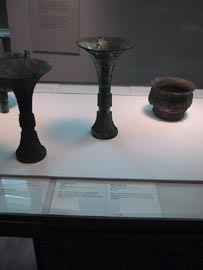 These are brass artifacts from 300BC... And here's the most ancient thing in the museum, a cup from 1300BC - over 3,000 years old! 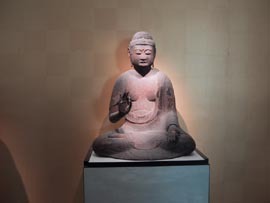 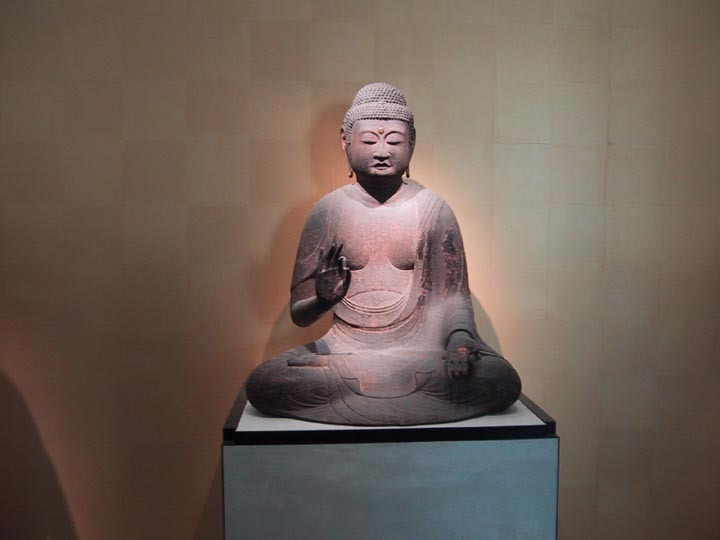 Amida, the Buddha of Western Paradise, circa 12th century Japan. 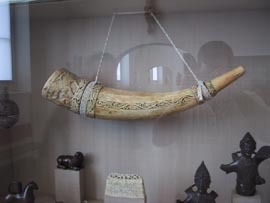 An oilphant, carved from an ivory tusk, used in religious ceremonies. 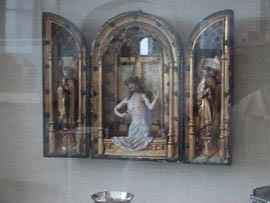 A choir screen circa 1500. 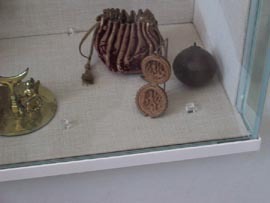 A wooden prayer ball, depicting the crucifixion. 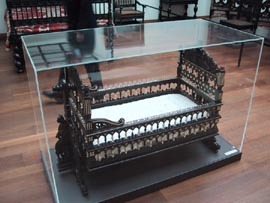 Miniature altars were carried by noblemen so that they might pray while traveling. 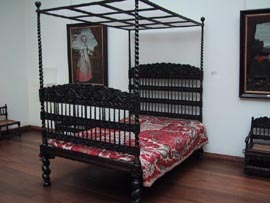 They fold up for portability. 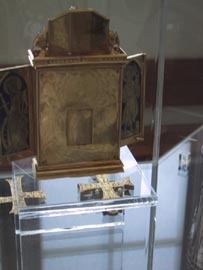 The altar on the left is about six inches high, three inches across when folded. They are wrought of gold, jewels and other precious metals and stones. 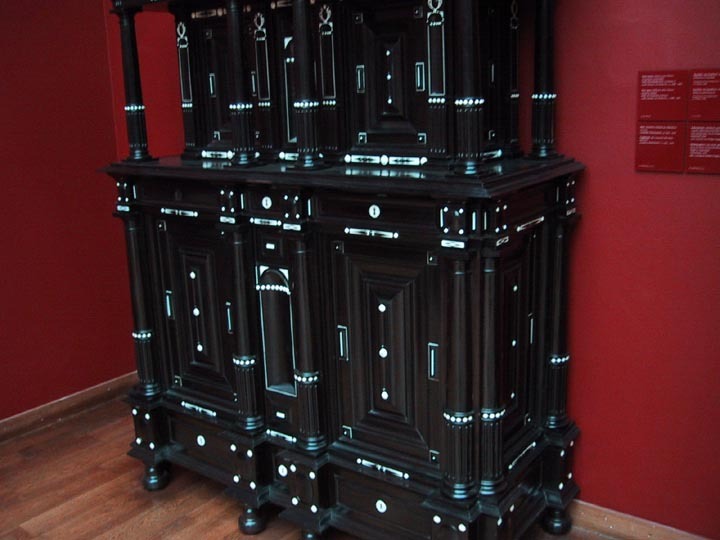 The craftsmanship is remarkable. Another miniature altar, this one even tinier than the previous one. 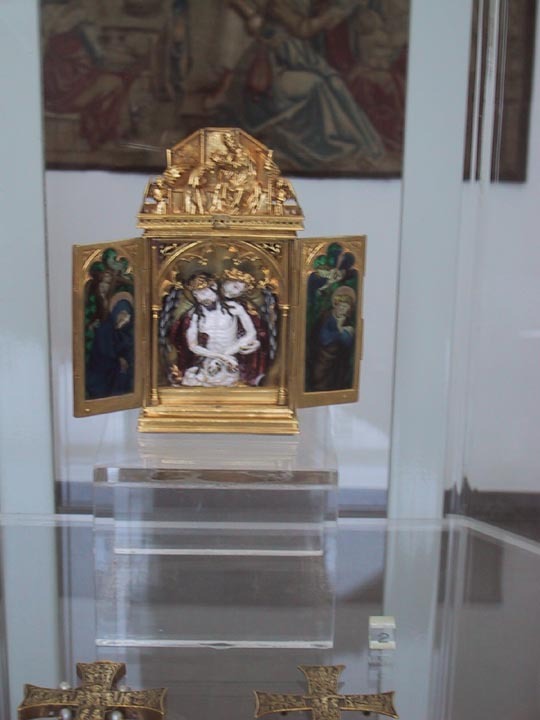 The back of this miniature has a sliding panel on it with a faint engraving of Christ. 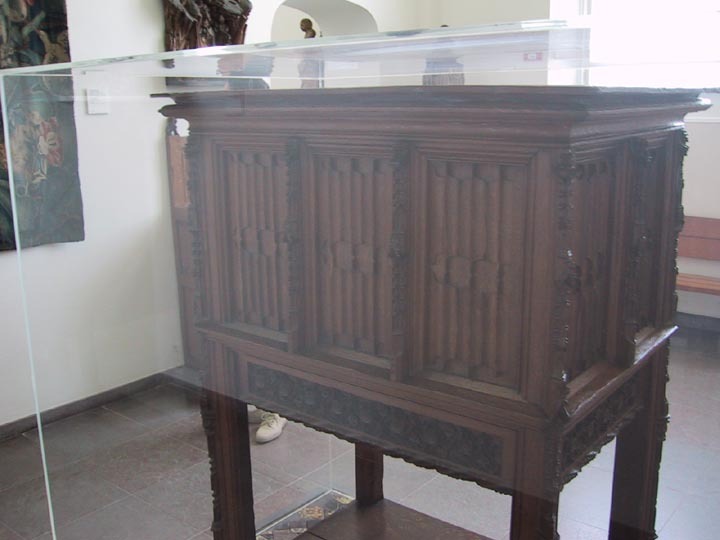 According to the captions, the chamber behind this panel was thought to contain hair from Christ's head. Probably the most remarkable religious artifact in the Rijksmuseum is this reliquary. 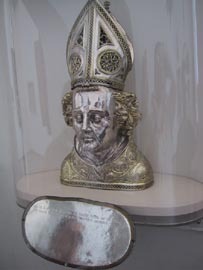 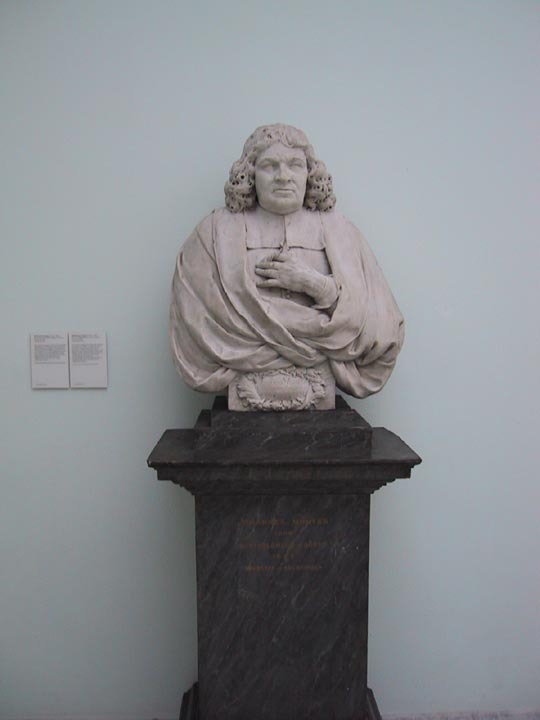 This bust contained part of the skull of Bishop Frederick of Utrecht, who was murdered in 838. 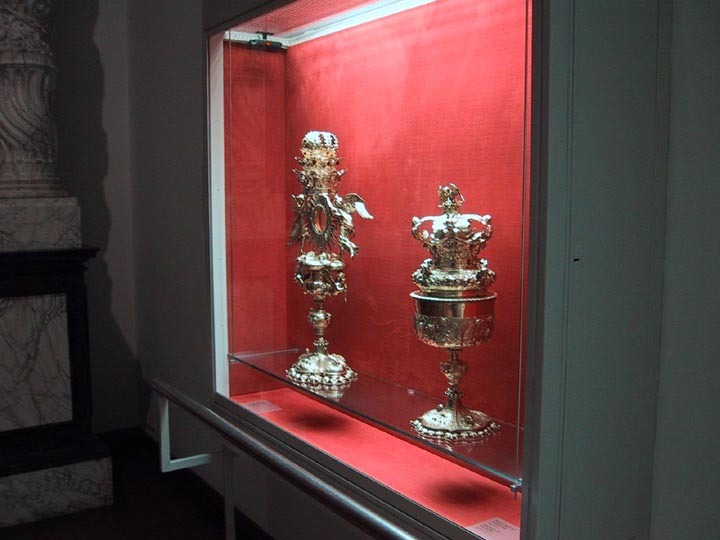 When the bishop's tomb was renovated in 1362, the silversmith Elias Swerpswert was commissioned to make a reliquary, a costly container for the saint's remains. 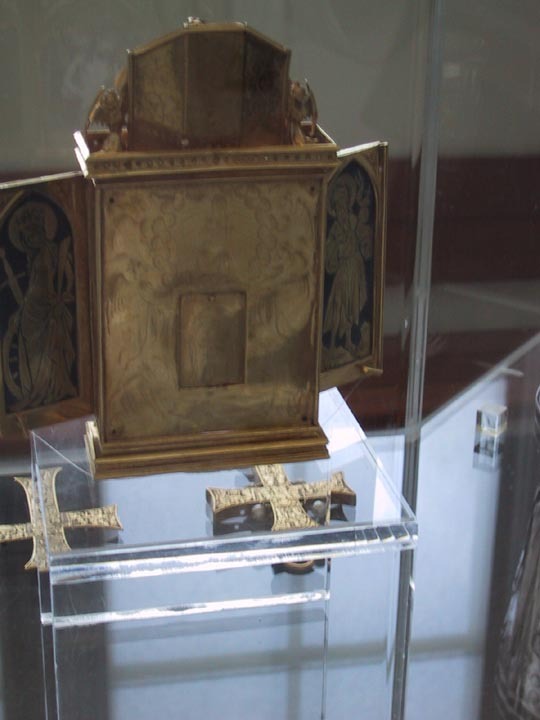 He made use of the type in which the shape indicates the nature of the relic that is kept inside. 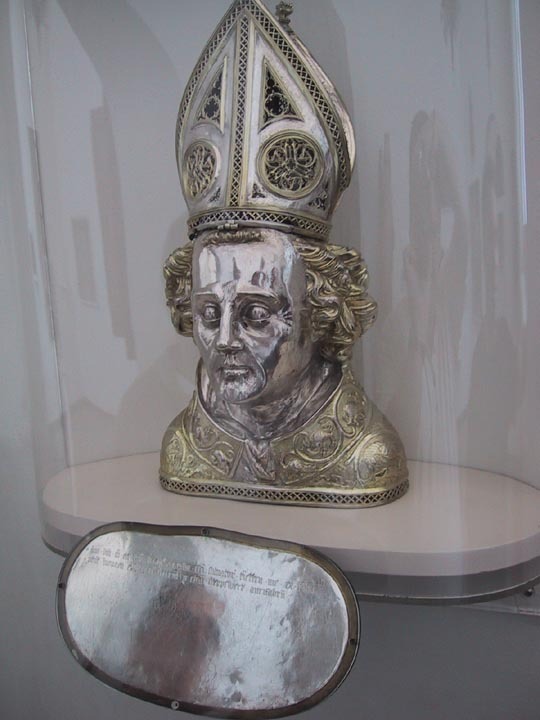 On feast days the silver head was displayed on the high altar in the church. It was also carried in processions.